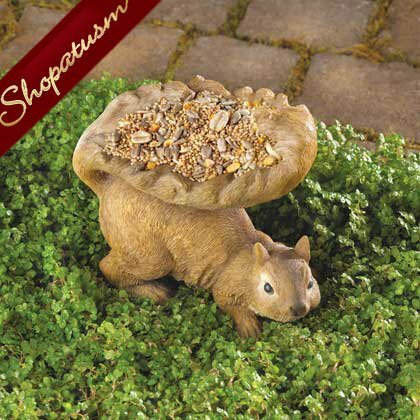 This is for a Woodland Brown Squirrel Garden Statue Bird feeder from Shopatusm. A plump brown squirrel shares his bounty with his feathered pals, cupping a generous serving of birdseed in his fluffy tail. Lifelike feeder is a lovable outdoor accent! Weight 1 lb. Polyresin. Birdseed not included. 7 inch x 4 inch x 6 inch high.